For this Medieval Romance Monday we are featuring the newest medieval romance release from award winning author Laurel O’Donnell – Angel’s Assassin. Damien is an assassin, a man with no home and a tortured past. Sold into slavery as a young boy, he is trained to kill with cold calculation, without remorse. Lady Aurora of Acquitaine is the epitome of purity and goodness, beloved by all her people. When Damien enters Aurora’s life, tempting her with promises of dark passion and forbidden lust, he threatens to tear her peaceful world apart. You can read more about Angel’s Assassin here. 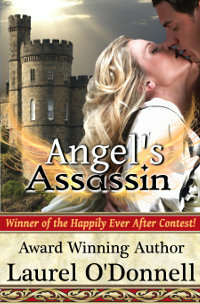 Author Laurel O’Donnell has also done some fun “interviews” with the characters from Angel’s Assassin. Read an interview with the lovely Lady Aurora of Acquitaine. This entry was posted in Blogs, Medieval Romance Monday and tagged angels assassin, laurel o'donnell, medieval romance monday. Bookmark the permalink.